Most of our evergreen species are narrow-leaved conifers – Pine, Spruce, Arborvitae, Juniper, Hemlock, and Yew – that have needles or scales for foliage. Unfortunately all of these species can be injured by winter burn. 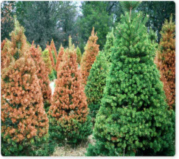 Winter burn injury is observed on many evergreen trees and shrubs every winter. Symptoms of winter burn are browning or bleaching of foliage, particularly on the south, southwest, and windward sides of plants. Evergreen foliage buried under snow is usually protected from damage while plant parts above the snowline are often damaged. In severe cases, the entire plant may turn brown and die. Sometimes symptoms occur immediately as damage occurs, but often symptoms appear or worsen as temperatures rise in late winter and early spring. Winter burn results from water loss in plants during winter. During the growing season, water is absorbed and pumped from soil into the roots of plants. From there, streams of water are suctioned up into a plant. Some of this water is used for plant growth and reproduction. The vast majority of this water is lost during transpiration, as water is released back into the atmosphere through small openings called Stomates on the lower surface of leaves. This lost water is quickly replaced as roots continue to absorb and pump water from soil into plants. As plants acclimate and prepare for winter, deciduous trees and shrubs drop their leaves with their thousands or millions of Stomates. Because evergreen woody plants retain their foliage, transpiration, and loss of water from Stomates continue during winter. This is especially true on sunny, and windy, winter days when higher temperatures and wind speeds increase transpiration rates. Because roots in frozen soil have no ability to replace this water, winter burn occurs as leaves desiccate, die, and turn brown. In more severe cases, buds, stem tissue, or entire plants may die. If leaves are dead, but buds and stem tissue are still alive, new plant foliage will regrow to replace winter burned foliage. On the other hand, if buds and stem tips were damaged, branches should be pruned back to ¼” above a bud in the live portion of the plant. 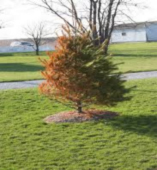 As with any tree under stress fertilizing will help it remain healthy. In severe cases the entire plant may have died and plant removal and replacement will be necessary. To help prevent winter burn in the future, keep evergreens properly watered throughout the entire growing season until ground freezes.Try to maintain a 3-4″ layer of organic mulch around evergreens to help retain soil moisture throughout the growing season. As this mulch breaks down, it will also improve your soil’s moisture holding capacity.You can protect plants in highly exposed sites during winter with burlap. snow fencing, or other materials to prevent too much exposure to sun or wind. Most of our evergreen species are narrow-leaved conifers - Pine, Spruce, Arborvitae, Juniper, Hemlock, and Yew - that have needles or scales for foliage. Unfortunately all of these species can be injured by winter burn. Winter burn injury is observed on many evergreen trees and shrubs every winter. Young, new plantings, are always going to be more vulnerable to stress and disease issues. To ensure the health of these small trees going forward, we recommend supplying the trees with plenty of water up until the ground freezes, and wrap the young trees with a protector such as burlap to shelter them from the wind. If you have any further questions or concerns please feel free to contact your local branch to speak with one of our Arborist!